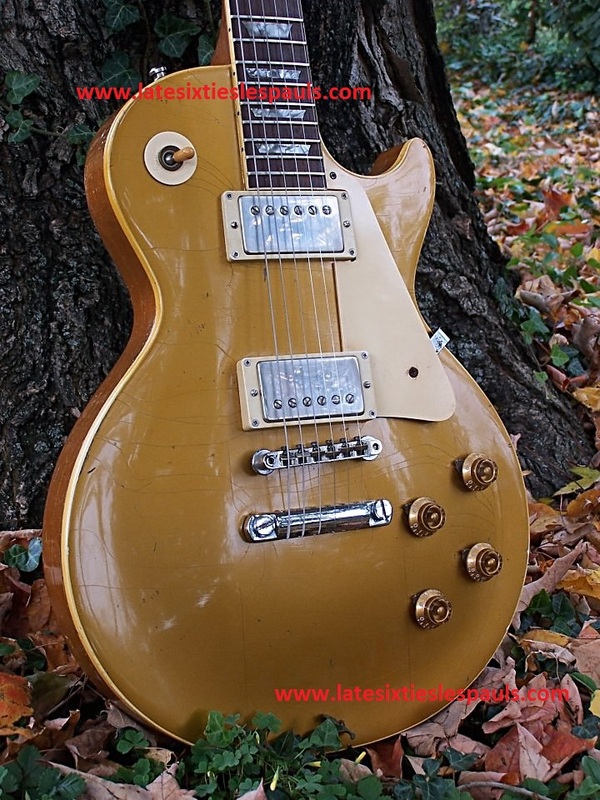 Early 1969 Les Paul Standard - Jeremy from the UK. 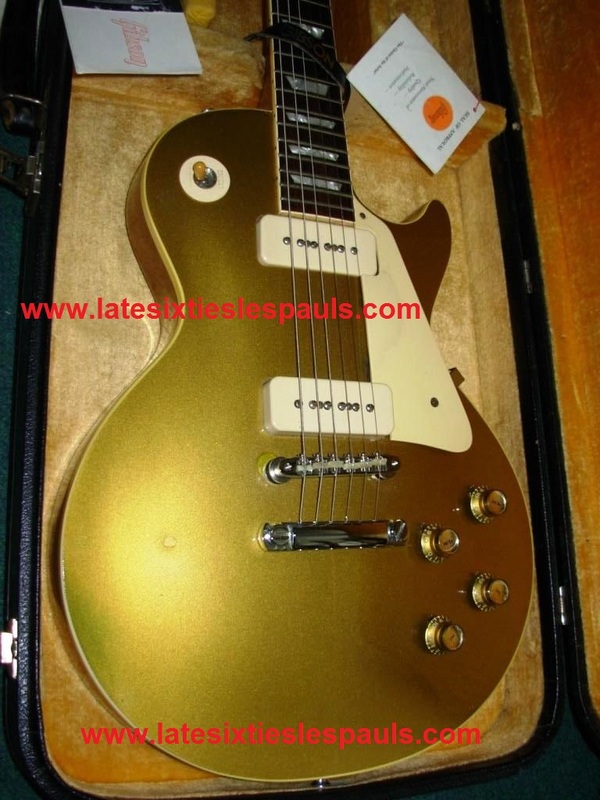 1969 Les Paul Standard Goldtop serial number 539xxx. 1 piece neck and body and long neck tenon. Chunky neck profile. I heard about the guitar from a friend who saw it in his local music shop. Unfortunately the price was too high. It then turned up at a nearby pawnbrokers and I made an offer and it was accepted. The guitar was being sold by the family of a guitarist that was in the 1970s prog rock band "Catapilla". It was used on both their albums. The band was made up of English and German musicians and the guitar was bought new from a German music shop in Bremerhaven. I am the second owner. Once had Grovers but I have re-installed the original Klusons. 1968 Park Plexi 50w and a 4x12 cab. 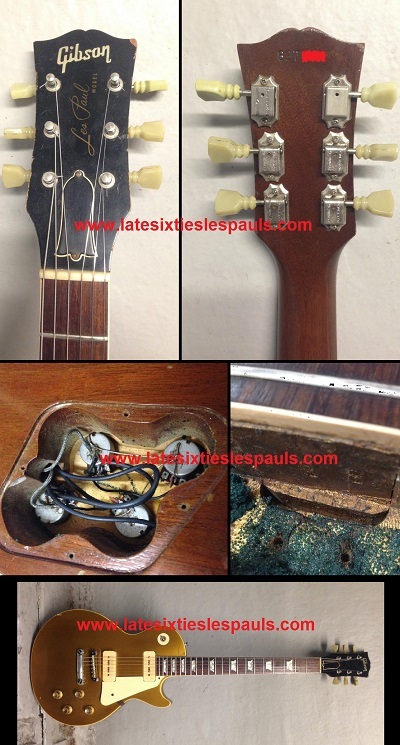 I think the 69 Standard has the ultimate specification e.g P90s and a tune o matic and a stop tailpiece. Jeremy. UK. 39 years. I like all types of music. My first guitar was a Japanese "Audition" bought from "Woolworths" in 1975. I wanted a solid body but my parents were advised to buy the semi acoustic model. I was a little disappointed as it didn't have the cool factor! 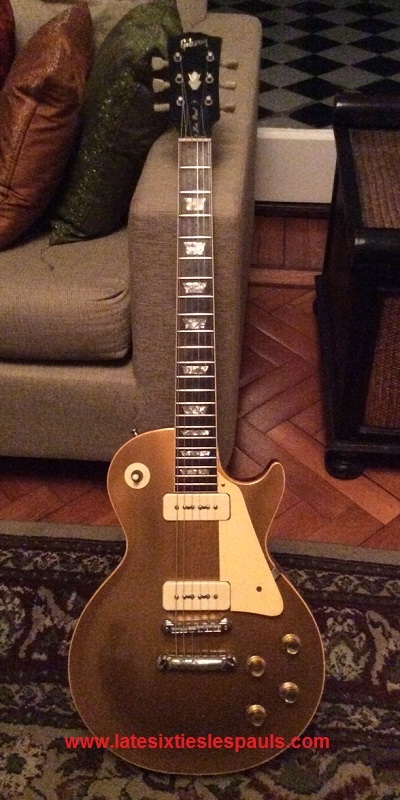 Middle 1969 Les Paul Custom - Harry from London,UK. E Bay trade, three years. Original except the pots. I do change the pickups and knobs sometimes. 73 Hiwatt DR112 mostly. I also use a Brunetti MC2 and sometimes a Marshall DL401. To replace a routed 71 Les Paul Deluxe I traded and missed. Harry, London UK, 11 Years, All types of music, there's good music in all genres. Changes all the time. A Rose Morris Les Paul Custom copy. 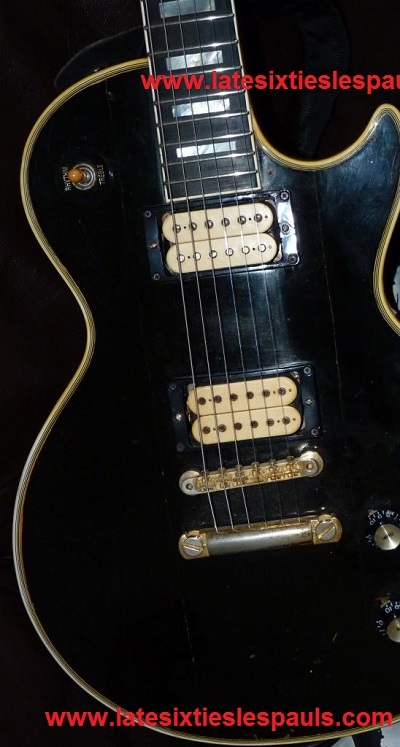 Early 1969 Les Paul Custom - Formerly owned by Pete from Oklahoma,USA. His history with the guitar is shown below. Currently owned by Marc from California,USA. See #39 to learn more about Marc. Mom and Pop Music Store in Ohio. Marshall Plexi JTM Black Flag (1967) 100 watt. Pete. Oklahoma USA. Since 8 years old. Rock Jazz Holdsworth, Hendrix, Lifeson, Chet, Lester William Polsfuss. Eminee. Larry Briggs (Strings West) had a 68 hanging for $1300 in 1983, which I thought was way too much. But I loved the way it looked, the top was more pronounced and it had that "look". It was never taken down to play so I never knew how it sounded. But I wanted one ever since. I actually found this guitar listed on eBay by a small music store.I set up a payment agreement with the owner and the store and paid it in 3 months.This is the best guitar I have ever owned as far as playability, tone and just sheer satisfaction. It screams.... but is super clear and bell like.One piece neck,long tenon,dotted i, 2 piece top and one piece body. I have not taken it apart except to remove back plate to read the pots. It is 100% original with original case. I also have the matching Gibson EM250 Mandolin. 1967/1969? Les Paul Deluxe w/50's Neck - Rich from Manchester,UK. It was purchased via a reputable London dealer and came from a previous owner who bought in in the states in 1989 as an original 1968 Standard. 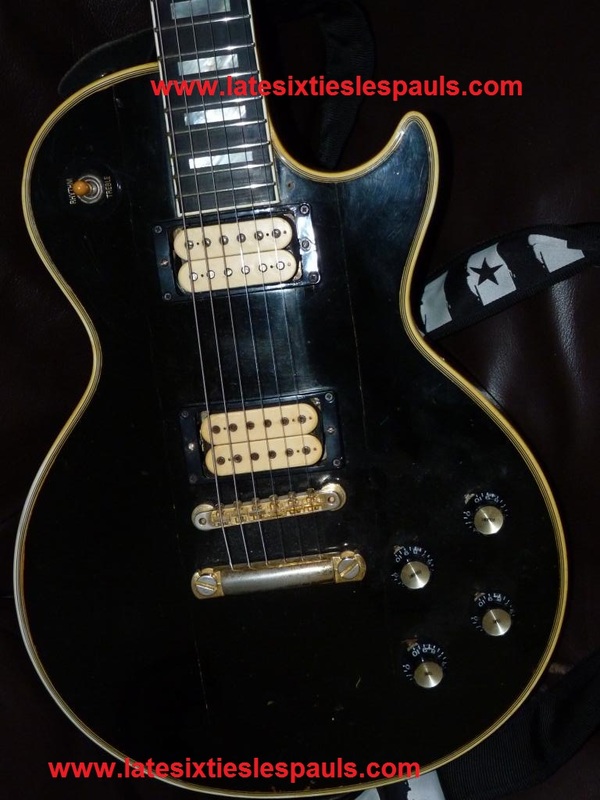 It was originally a 1969 Deluxe with mini humbuckers that were changed to 50's P90s. The pots were also changed. After much research an analysis the guitar is believed to have been made in the factory with a leftover neck from the late 50's with a 17 degree headstock angle and a partly routed early 68 body with an unusual early 68 control cavity. It has it's original factory finish and apart from the pickups and pots all 1969 parts. I use a 58 Tweed Deluxe clone made by Gartone Amps in the U.K. or a 1970's HH VS 212 Valvesound combo. I loved the look and feel of the guitar, especially with it having the 59 neck profile and steep headstock pitch it has the vibe of a 1956 P90 guitar. From MyLesPaul and the Les Paul Forum. My name is Richard and I am from Manchester in the UK. I've been playing guitar for 31 years. Grew up listening to 60's British pop music like The Beatles, The Stones, The Who then got into punk, new wave and classic rock but nowadays I like gospel, blues and any good guitar music. Modified/ routed for humbuckers. Duncan custom wound antiq. G.I. inspired. JVM-210C. really depends on club/bar. All kinds of good music. Grovers added. Replaced saddles. Heavy tailpiece/not orig. Original frets. A great guitar. 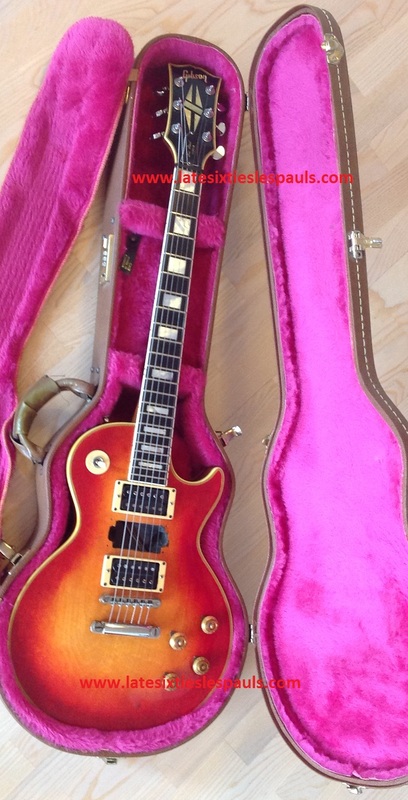 Purchased 2nd/ 3rd hand from the lead guitarist of a German/Italian – Euro/prog-rock band(Analogy/Earthbound) in London - summer of 1978 as he was buying a replacement instrument. Replacement pick guard and tuners. Guitar was available .We needed extra instruments for a band we were forming and I had the cash! Didn’t start investigating the guitar seriously until around 2010. My name is Tim, ex- pat Canadian living in England since 1966. Been playing guitar ( poorly) since 1964. Play all sorts, bluesey, rocky, folky. I like Stones,, Grateful Dead, Led Zep, The Band (i.e. all the good stuff). No neck volute whatsoever, one piece body? and Gibson headstock logo has open top "b" and "o" with no dot over the "i". 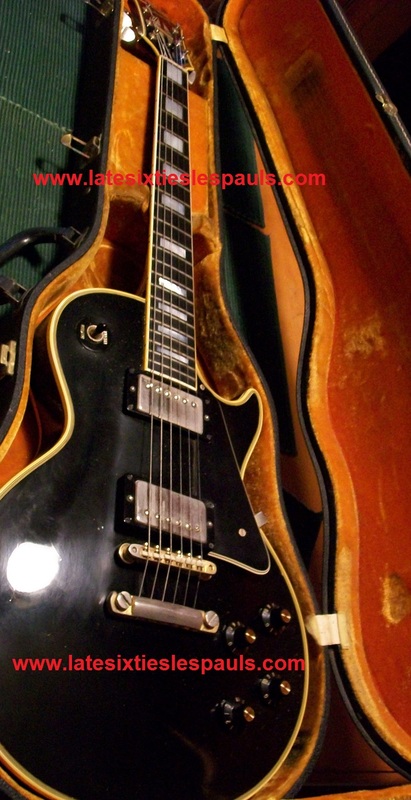 Ebay had a 1968/69 model stating that a dotless "i" in Gibson indicates a transition model? Martin Thurn-Mithoff ----- Purchased 2nd/ 3rd hand from the lead guitarist of a German/Italian – Euro/prog-rock band (Analogy/Earthbound) in London - summer of 1978 as he was buying a replacement instrument. Also a LP Custom WINE RED. The guitar had come to England via Italy and Germany and the owner had purchased it in 1972 or earlier. Attempts to re-contact Martin have proved fruitless to date ( 21 March 2014). See photographs and story here: http://psychedelicbaby.blogspot.com/2011/10/analogy-interview-with-martin-thurn.html WARNING: NSFW image at this link. 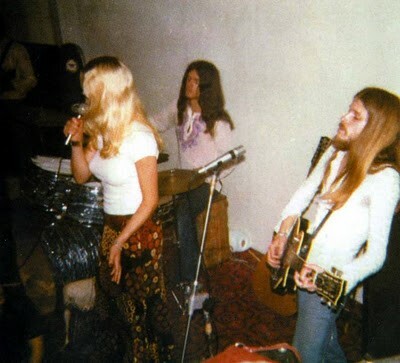 "Question: In June 1972, you released your LP on the Ventotto label…What gear did you use?" 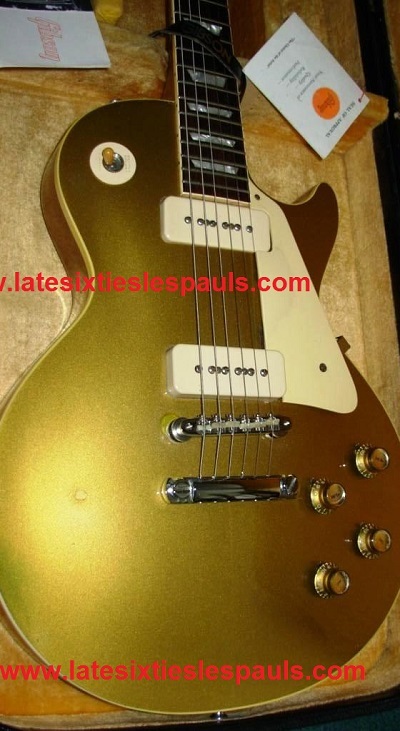 "Answer: Gibson Les Paul Custom - Vox AC30 - Binson Echo - fuzz box"
Gold finish [EDIT: on hardware] largely gone. Refretted in 1978 by Andy’s in Denmark street as had been gigged heavily over the 6 – 8 years prior and the frets were buzzing. 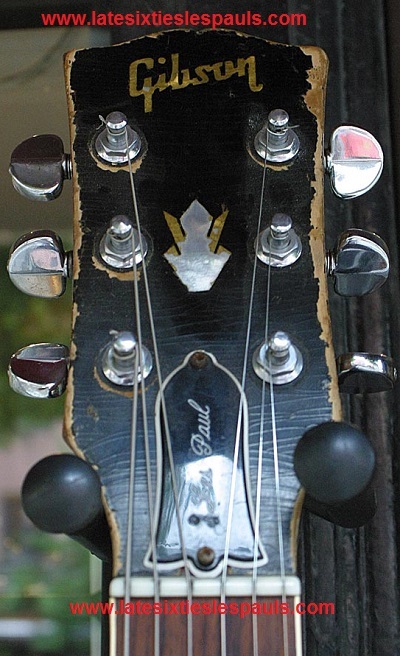 Appears to have replacement, chrome machine head/tuning pegs. I possibly had them replaced when it was re-fretted. I have a vague recollection of some damage to the originals but in all honesty, can’t really remember. I put a replacement a pick guard (original was missing) , lead plug plate (still have the original) and pick-up switch knob on it. Played very little since early 1980’s but has been well looked after. With a hard case but not the original Gibson case. Guitar was used by Patrick Bergin (singer/rhythm guitar) in our little London pub rock band as I chose to play bass during late 1970’s. 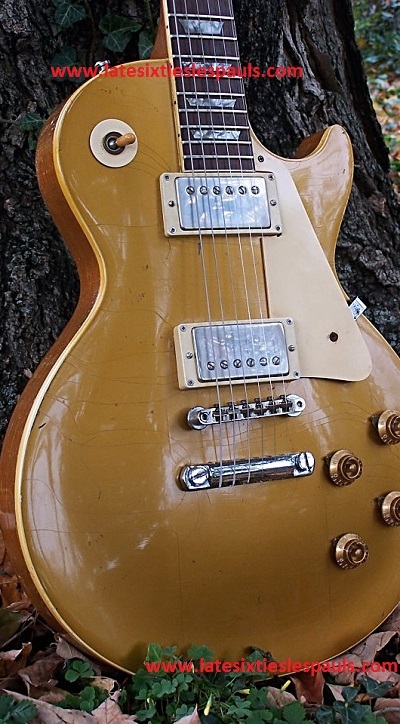 Later 1969 Les Paul Deluxe - Dan from Ohio,USA. It had been routed for humbuckers and had the top stripped and painted with an amber clearcoat back in the 1970's. The back and neck have the original finish. I sent it to Roy at RS Guitarworks and he did a beautiful job of applying an aged gold finish to the top. It is currently loaded with a pair of Throbak SLE-101 pickups and it sounds as good as it looks. I never expected that this would happen, but gave up my dedicated pedal board and have been using a Boss GT-100 multi-effects board exclusively for a couple of years ago. Excellent tones can be pulled from this unit if you invest the time in setting it up. Amps vary, but most recently I've been feeding the GT into the return of an Egnater Rebel 20 connected to a 112X with a Celestion G12H30. A '59 burst didn't quite fit the budget. From My Les Paul Forum. Dan B in Ohio. Been playing since the mid-1970's. 60's, 70's, & 80's classic rock would be my favorite when it comes to playing guitar. As far as listening goes, I can enjoy just about anything except disco and rap. 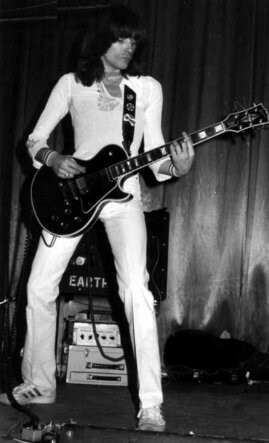 Extreme Late 1969 (Possibly Early 1970) Les Paul Custom - Flemming from Denmark. Found it on a web site wher you can sell everything. I have owned it for ca. 10 years. It is modified : Refin, tuners changed, pots and knobs changed, abr-1 + stop tail piece could also have been changed, frets and nut. Also a third hole has been made for the extra middle pu, which also is a T-top but messures around 25 kOhms and I have removed. Well, I already have an original black 1979 LPC, and when I saw this 69 it was affordable and sounded well, so I bought it. Despite the high Serial number, i've dated it 12/1969 because it has almost no volute on back of the neck, but it still have the open o & b in Gibson logo and it is a pancake body. 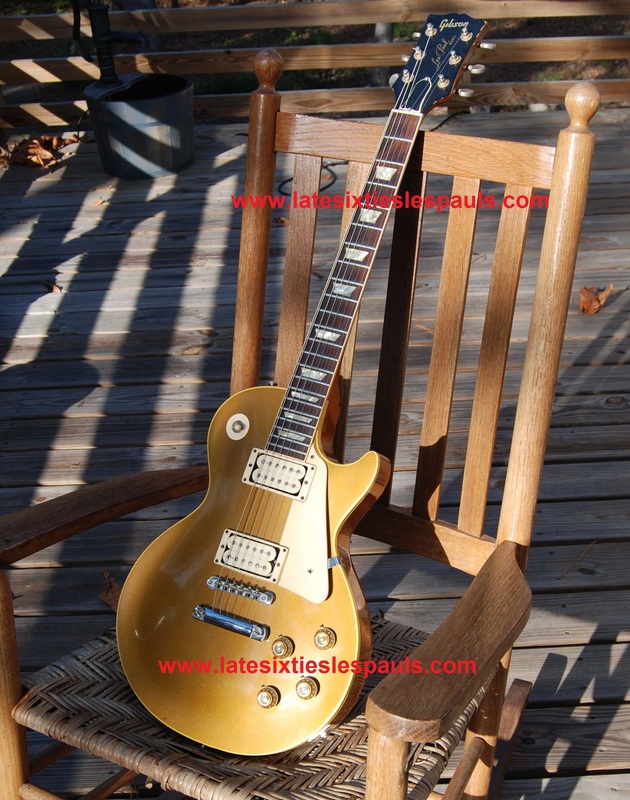 Very Early, First Series 1968 Les Paul Standard - Albert from Argentina. I have a very early 1968 Standard Goldtop serial #975XXX. I only recently acquired this beautiful guitar. I have been a collector of Les Pauls for some years, but this is my first ’68. I searched high and low for this one, and finally was at the right place at the right time with a private collector who was willing to sell. 100% original. At one point many years ago, someone put Grover tuners on it, but the original Kluson double ring have been back on it for many years now. I am a fanatic of all things Gibson Les Paul. I collect Les Pauls. 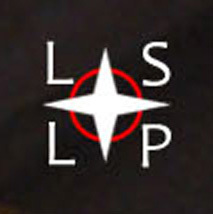 As I learned more about the LSLPs (this site helped so much), I really got intrigued. I really like the very early ones with their raw, simple (one piece body and neck), small headstock and P90s. The closest I’ll get to a 1956 LP for a while. My name is Albert. I am 50 years old and have been playing guitar since I was eleven. I was born and raised in the United States, but have lived many years now in Buenos Aires, Argentina. I love it here. I love many different types of music, but it all comes back to great rock and roll, hard rock, progressive rock and metal for me. From Jimmy Page to Tony Iomi, from Randy Rhoads to John Petrucci, from Richie Blackmore to Slash, from Alex Lifeson to Joe Satriani, and on and on. My sincere gratitude for this site. Thank you so much for your time, dedication and sharing of knowledge. 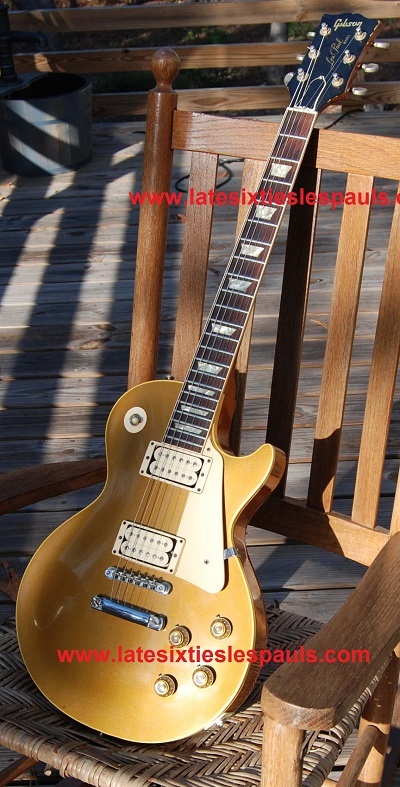 Very Early, First Series 1968 Les Paul Standard - Nysse from Sweden. Nysse's guitar has the lowest serial number I have seen yet. 970xxx. It is part of the super rare, very early First Series guitars. Nysse has owned his since 1977. See the link below to read an entire article about it. Very modified, shaved neck, refin except for back and sides of body and the front and back of the headstock. Changed truss rod cover. Routed, Grovered, Bigsby'ed and autographed by Joe Walsh! Nysse did not say in our correspondence. See the link below to read an entire article about Nysse and his guitar..
guitar, additional pictures as well!